Presto continues its reign as the king of deep fryers, earning praise from both owners and experts for practically every model in the company's lineup. Oil-free deep fryers are gaining popularity among people adopting a healthier diet, and while the T-fal ActiFry Multi-Cooker is still the top pick in this category. 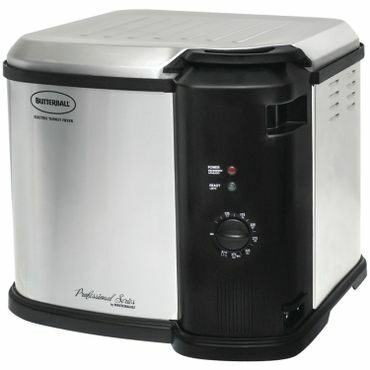 Specs that Matter Watts - 1,500 Adjustable temp - Yes Size (d,w,h) - 14.5" x 10" x 9"
If you're looking for a simple, low-mess, low-odor deep fryer, the Presto 05442 CoolDaddy Deep Fryer can't be beat, say reviewers. With adjustable temperature controls and a convenient temperature indicator light, there's no guesswork involved in knowing when the fryer's ready to cook. An external handle lowers the basket with the lid closed to eliminate splatters. The CoolDaddy's six-cup capacity makes about two generous servings. 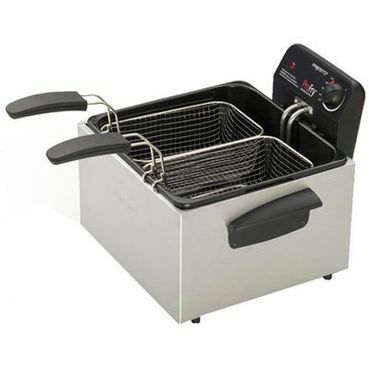 Specs that Matter Watts - 1,800 Adjustable temp - Yes Size (d,w,h) - 16" x 15" x 11"
The Presto 05466 Dual Basket Deep Fryer has a generous 12-cup capacity along with two oblong baskets for more versatile frying options, including larger pieces of food like whole fish. An adjustable thermostat and signal lights make this deep fryer very intuitive to use. At 1,800 watts it recovers its temperature quickly between batches. It's also reported as easy to use and clean. Specs that Matter Watts - 1,450 Adjustable temp - No Size (d,w,h) - 16.7" x 13.6" x 9.4"
While it's not entirely oil-less, the T-fal ActiFry requires as little as a single tablespoon of oil to provide the flavor of traditional deep frying without the drawbacks of cooking in large quantities of oil. Its self-stirring design makes it useful for effortlessly cooking a variety of foods, including stir-fry dishes and risotto. Its nonstick interior and dishwasher-safe parts make for easy cleanup. Specs that Matter Watts - 1,650 Adjustable temp - Yes Size (d,w,h) - 16" x 16" x 14"
Love fried turkey but can't (or don't want to) cook outside? The Masterbuilt Butterball Indoor Electric Turkey Fryer is a safer, more convenient option than the standard outdoor turkey fryer. Turkeys of up to 14 pounds come out moist on the inside with a slight crisp on the outside. It's not just for Thanksgiving, either; you can use it for a wide variety of fried or steamed foods. Specs that Matter Watts - N/A Adjustable temp - N/A Size (d,w,h) - 14" x 14" x 17"
The Bayou Classic 3025 30-Quart Aluminum Turkey Fryer Pot earns high praise from devotees of traditional, deep-fried turkey. This stock pot will fry a perfectly crispy-on-the-outside, juicy-on-the-inside turkey in about 45 minutes for an 18-pound bird. 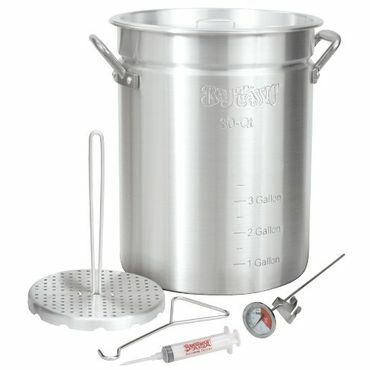 The turkey fryer kit includes a thermometer, seasoning injector and poultry rack. For safety, however, only consider the Bayou Classic turkey deep fryer if you plan on cooking your bird outdoors. Specs that Matter Watts - N/A Adjustable temp - No Size (d,w,h) - 21" x 21" x 24.5"
If you love the taste of deep-fried turkey, but don't like the thought of all that oil, the Char-Broil The Big Easy TRU-Infrared Oil-less Turkey Fryer is an easy-to-use, oil-free alternative to standard deep fryers that users say makes a very tasty bird. Because it requires propane, it must be used outdoors. However, that makes it a good choice for outdoor events such as tailgating and parties. These are a convenient alternative to the old-fashioned method of using a large pot filled with oil on the stovetop, and are generally easier to use than deep fryers powered by propane. The best electric deep fryers have enclosed heating elements that are safer than using a substantial amount of oil over an open flame, and many electric deep fryers come with lids that prevent splatters from creating a mess and causing burns. Most of the home deep fryers in this report are electric models. While they aren't truly oil free, oil-less deep fryers use much less; often only a tablespoon or light coating of oil. They can be powered by electricity or propane. This type of home deep fryer is a versatile cooking unit designed to produce the same restaurant-style fried taste without the hassle, expense and mess of dealing with large amounts of cooking oil. Many of these also steam or perform other cooking tasks, like stir-frying. 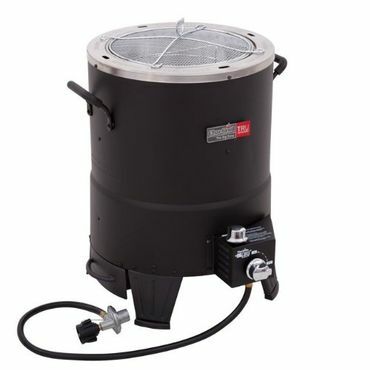 Turkey deep fryers come in all configurations -- electric or propane, oil or oil-less. The only difference between a turkey deep fryer and other home deep fryers is that you need to have the interior capacity for a large bird. However, many people don't like to deep fry a large turkey, even if the manufacturer says the deep fryer has the ability to do so; they prefer frying two smaller birds of about 10 to 12 pounds, saying they get better results. There aren't many professional tests of deep fryers, although we did find a few comprehensive roundups from experts at Your Best Digs, Top Ten Reviews and Wirecutter. All of these sites conduct head-to-head testing and provide in-depth reviews. Because there are few professional tests, we relied heavily on owner feedback on retail sites such as Amazon, Walmart and Bed Bath & Beyond, to name just a few, analyzing thousands of user reviews for long-term, real-world experiences with home deep fryers. Owners tend to be passionate about their cookers, and the reviews we read were detailed -- some were even updated after several years of the owner using his or her deep fryer. The result of that research is our recommendations for the home deep fryers with the best combination of performance, ease of use and durability. 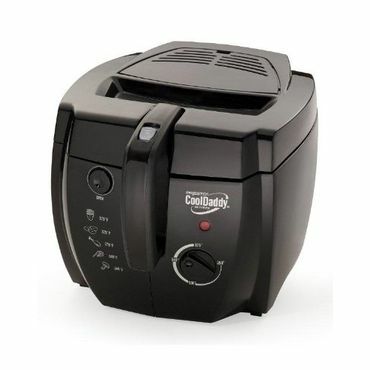 If you don't plan to deep-fry a lot of food or you need just a side dish for a couple of people, the Presto 05442 CoolDaddy Deep Fryer (Est. $50) has a 6-cup capacity that owners generally say is enough for about two people, depending on your serving-size preferences. With 1,500 watts of power, this small deep fryer heats up quickly and recovers fast after foods are added, resulting in crisp, evenly cooked foods. The Presto CoolDaddy has a useful feature that eliminates the annoying -- and sometimes painful -- grease splatters that are common when adding foods to a heated pot of oil. The basket has an exterior handle that's used to lower the basket into the oil with the lid closed, which then prevents grease from splattering outside the unit when it comes in contact with cold or frozen foods. The lid also contains a charcoal air filter, which reduces the unpleasant frying odors that tend to infiltrate kitchens where deep fryers are used. There are no fancy digital controls on the CoolDaddy, just a simple knob to adjust the desired oil temperature up to 375 degrees Fahrenheit. The non-stick interior pot is removable for cleaning, although it's not dishwasher-safe. Overall, reviewers are pleased with this home deep fryer's performance, noting that it doesn't take up a lot of storage space, but serves the purpose when they have a craving for fried food. We review the black model here, but the CoolDaddy 05443 (Est. $40) is the same fryer with a white finish. However, owners say it stains more easily and is harder to clean. This deep fryer is backed by a one-year warranty. If you don't use a deep fryer often or are looking for a simpler, more basic option, the Presto GranPappy 6-Cup Deep Fryer 05411 (Est. $35) is just that: It has one temperature setting (meaning no buttons or dial to adjust), and it consists of a heavy-duty, cast aluminum bucket and lid with a handle. A scoop for removing foods from the fryer is also included. In testing conducted by Top Ten Reviews, the 1,500-watt Presto GranPappy took about 15 minutes to reach cooking temperature and about five minutes to recover after foods were added. Users say it's simple, reliable, and efficient, and it heats and cooks quickly as long as you don't try to cook too much food at one time. Like the Presto 05442, the Presto GranPappy has a 6-cup capacity. With a non-stick surface inside and out and no messy basket to handle, the GranPappy is easy to clean, and its lid locks in place for convenient oil storage between uses -- but make sure the fryer has cooled completely before attaching the lid. It's also backed by a one-year warranty. If you need even less capacity than the 6-cup Presto 05442 or Presto 05411, the 4-cup Presto 05420 (Est. $25) earns solid feedback from experts and users alike. Your Best Digs' Bryan Vu names it the best deep fryer under $20. (The retail price is actually $25. You can usually find it on sale for less than $20, but around the holidays except prices closer to retail). Yu notes that the 05420's compact size makes it convenient to store. In testing, it heats and maintains oil at consistent temperatures, preparing crisp foods with no oily after-taste. A few users say this deep fryer is basically a glorified pan of oil, but some features make it more convenient than that. Like the Presto GranPappy 05411, it has a snap on lid that enables you to refrigerate the oil right in the pot to reuse later -- just be sure the oil has cooled first. One thing owners like is that the basket can be lowered with the lid in place from outside the pot, eliminating messy grease splatters. The nonstick pot removes for easy cleaning, but it's not dishwasher-safe. While Presto is the favorite deep fryer of most users, earning terrific reviews across the board for its entire line, the DeLonghi Roto Deep D677UX (Est. $70) earns praise for its safety features. Editors at Top Ten Reviews say it's one of the safest deep fryers they tested, with a design that allows users to lower the basket while the lid is closed, eliminating dangerous oil splatters. It's also equipped with non-slip feet, handles, and stay-cool exterior walls, and it has a patented oil draining system -- simply pull out the hose that's stored in the front of the unit to drain used oil into a safe container for disposal. A non-stick interior makes cleanup a breeze, and the DeLonghi's detachable magnetic cord detaches from the fryer if accidentally pulled, avoiding potentially dangerous spills. With an adjustable thermostat -- from 300 to 370 degrees -- and an indicator light that lets you know when the oil has reached the desired temperature, the 1,500-watt DeLonghi Roto is easy to use. In professional tests, it cooks a variety of foods effectively and also does a good job of minimizing frying odors. It has a capacity of 2.2 pounds (users say it can hold about four cups). While most owners are pleased with the ease of use and performance of this deep fryer, we did read a few complaints about units that failed to reach desired temperatures, leaks and units that stop working after a few weeks or months of use. It is backed by a one-year warranty. Owners say the Presto 05466 Dual Basket Deep Fryer (Est. $70) is a great choice for larger serving sizes. It has a generous, 12-cup capacity and a two-basket design that makes it possible to cook two different foods at once. The oblong baskets are also well-suited to larger pieces of food, like whole fish. Its 1,800-watt heating element heats up the fryer quickly and maintains the ideal frying temperature well. In tests conducted by Top Ten Reviews, foods prepared with the Presto 05466 were about average in terms of texture and taste. It does require a lot of oil, about five quarts per use, but oil can be reused a few times depending on how well it's filtered. The Presto 05466 has an adjustable thermostat and a signal light lets you know when the oil is ready to use. Users and experts say the oil returns to temperature quickly after frying, making it quick to fry in multiple batches. The removable pot is easy to clean. The Hamilton Beach Electric Deep Fryer 35034 (Est. $60) comes with three baskets (one large and two small baskets, which fit side-by-side in the fryer) and boasts a generous, 12-cup capacity. It has an adjustable temperature, from 265 degrees to 375 degrees, with an indicator light to let you know when it's ready, and a cooking timer that can be set from five to 30 minutes, as well as a "stay on" function. Editors at Your Best Digs say the Hamilton Beach cooks crisp, but oily fries, and that it struggled to reach and maintain cooking temperatures in tests, which they attribute to the unit's thin aluminum casing. Users agree that the build quality feels a bit flimsy, but most say it's a versatile deep fryer that heats up quickly and recovers fast after foods are added. Owners say that it's easy to disassemble the unit, which coupled with the dishwasher-safe baskets, make this deep fryer easy to clean -- aside from the immersed heating element, which is a bit more cumbersome to clean. The Hamilton Beach 35034 is backed by a five-year warranty. If you use a deep fryer for only one food item a time and don't need a multi-basket design, the T-fal FR8000 (Est. $110) also gets positive feedback from owners. Editors at Your Best Digs award it runner-up status, saying it "delivered perfectly cooked chicken and fries with the nice crunch and minimal greasiness." It costs a bit more than the Presto, but has a built-in filtration system that reduces the work involved in draining and filtering oil for reuse. It's available in a 2.2-pound or 2.65-pound capacity, but with just a single basket. A locking lid with a built-in filter keeps smoke and odors from filling the room, and most of its parts are dishwasher-safe. Editors at Your Best Digs rave about the Cuisinart CDF-200 Deep Fryer (Est. $70), which was the only fryer they tested that reached the ideal temperature of 375 degrees. It heats up quickly, editors say, and while its reheating time is a bit slower, it maintains a sufficient temperature for evenly-cooked foods without an oily residue. The 1,800-watt Cuisinart has a built-in timer, which doesn't control the fryer's power but makes it easy to time food prep, and its one-gallon, enamel-coated oil container is removable and has a pouring spout for easy draining. With a four-quart capacity, the Cuisinart can handle up to 2.3 pounds of food, although in testing it handled up to 2.5 pounds of chicken wings with ease, producing dark, golden chicken wings with juicy interiors. Its retractable, cool-touch basket handle allows for easier storage. According to editors at Your Best Digs, the Cuisinart CDF-200 was previously manufactured by Waring, model DF250B. Waring no longer manufactures home deep fryers and has transferred all models to Cuisinart. Among owner-written reviews (some of which refer to the Waring model), we read a few complaints from owners who say their deep fryers stopped working after a few months of use, but overall, user feedback is mostly positive. Users say it's fast and efficient, produces perfectly-cooked foods, and is easy to clean. It's backed by Cuisinart's one-year limited warranty. 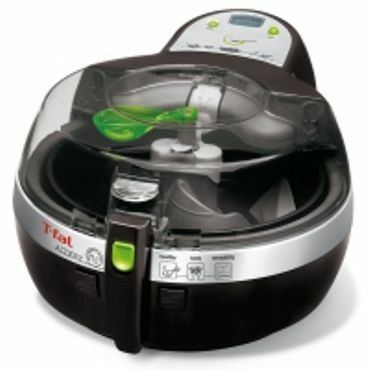 If you want an oil-free alternative to deep-frying but don't want to give up the authentic deep-fried taste, the T-fal ActiFry Multi-Cooker (Est. $150) is a great choice, users say. This versatile deep fryer can cook more than just fried foods; you can use it to create risotto, stir-fry dishes and more. Its paddle automatically stirs food and a digital timer buzzes to alert you when time is up, so cooking is practically hands-free. The ActiFry generally requires about 1 tablespoon of oil to moisten foods and reduce sticking, but users say it produces great-tasting French fries and many other foods. In fact, some say they can't tell the difference between foods made with the ActiFry and those made with a traditional deep fryer. A secure lid prevents splatters during cooking, and its equipped with a filter to reduce odors. Its ceramic-coated, non-stick pan is removable, and all the parts other than the heating element are dishwasher-safe, making cleanup a cinch. The T-fal ActiFry has a capacity of about 2.2 pounds and is backed by a one-year limited warranty. If you don't mind spending a bit more, owners say the Phillips Airfryer HD9220/26 (Est. $200) produces foods that taste similar to those prepared in a regular deep fryer. It uses Rapid Air technology to circulate hot air around the metal mesh cooking basket, producing foods that are crispy on the outside and tender on the inside. The removable, non-stick coated drawer and food basket are dishwasher-safe for easy cleanup. The 1,425-watt Phillips Airfryer has an adjustable temperature control (up to 390 degrees), a built-in, a 30-minute cooking timer with an audible beep to let you know when your food is ready and an automatic shutoff feature. It can handle up to 1.75 pounds of food, and users say it's quiet, convenient for quick meals and easy to clean.